Viewing 24 of 51 items. A Stationery Studio exclusive! 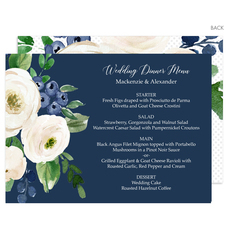 This set of beautiful floral designed menu cards is perfect for your next event. Back of cards are fully designed. Size of cards is 5" x 7". Flat printed in..
A Stationery Studio exclusive! 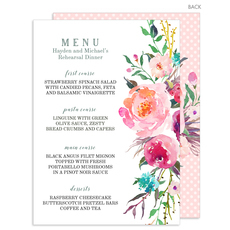 This set of beautiful floral spray designed menu cards is perfect for your next event. Back of cards are fully designed. Size of cards is 5" x 7". Flat..
A Stationery Studio exclusive! 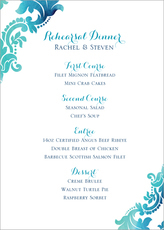 This set of beautiful menu cards are perfect for your next event. Back of cards are fully designed. Size of cards is 5" x 7". Flat printed in ink color as..
A Stationery Studio exclusive! 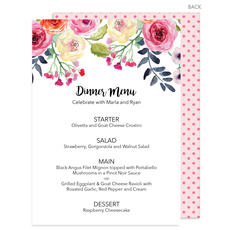 This set of beautiful bouquet of flowers menu cards would be a perfect addition to complete your table settings. Back of cards are fully designed. Size of cards is.. 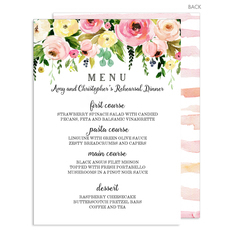 This set of pretty menu cards will be perfect for your upcoming occasion. Back of cards are fully designed as shown on sample. Size of cards is 5" x 7". Flat printed in ink colors and..
A Stationery Studio exclusive! 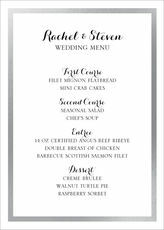 This set of modern and clean designed menu cards is perfect for your next event. Back of cards are fully designed. Size of cards is 5" x 7". Flat printed in.. 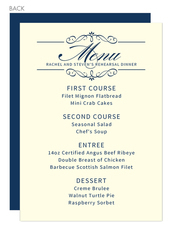 This set of classic menu cards with a foil border design can really embellish your next event. 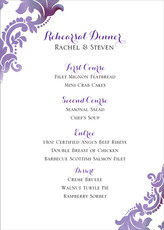 Back of cards are fully designed as shown on sample. Size of cards is 5" x 7". Flat printed in.. This set of lovely menu cards will be wonderful at your next event. Back of cards are fully designed as shown on sample. Size of cards is 5" x 7". Flat printed in ink color and typestyles.. 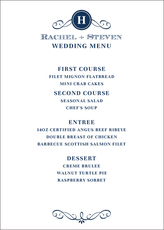 This set of beautiful menu cards can are perfect for your next event. Back of cards are fully designed as shown on sample. Size of cards is 5" x 7". Flat printed in ink colors and..
A Stationery Studio exclusive! 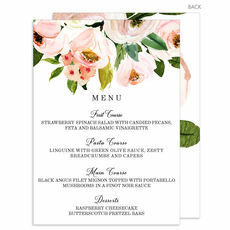 This set of beautiful floral designed menu cards is perfect for your next event. Back of cards are fully designed. Size of cards is 7" x 5". Flat printed in..
A Stationery Studio exclusive! 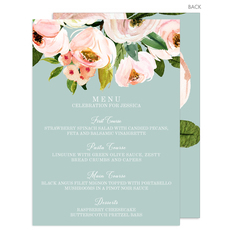 This set of beautiful floral designed menu cards is a perfect accessory for your next event. Back of cards are fully designed. Size of cards is 5" x 7". Flat.. 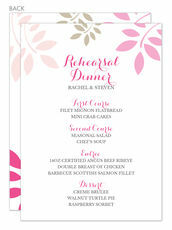 This set of pretty menu cards will be perfect for your upcoming occasion. 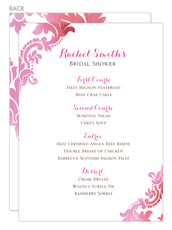 Back of cards are fully designed as shown on sample. Size of cards is 5" x 7". Flat printed in ink colors of your.. 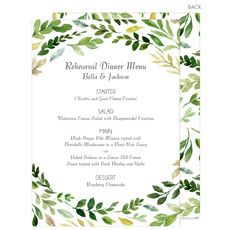 This set of elegant and lovely menu cards can really embellish the table settings at your next event. Back of cards are fully designed as shown on sample. Size of cards is 5" x 7". Flat.. 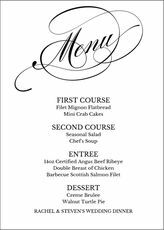 This set of modern menu cards are ideal for your next event. Back of cards are fully designed as shown on sample. Size of cards is 5" x 7". 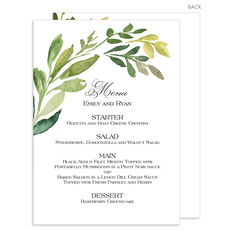 Flat printed in ink color as shown with.. 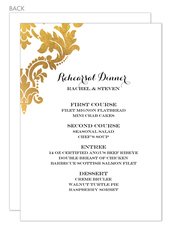 This set of modern yet sophisticated menu cards can really embellish the table settings at your next event. 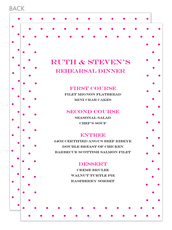 Back of cards are fully designed as shown on sample. Size of cards is 5" x 7". .. 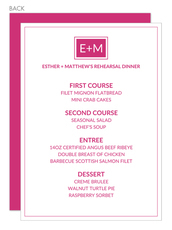 This set of modern menu cards can really embellish your next event. Back of cards are fully designed as shown on sample. Size of cards is 5" x 7". Flat printed in ink color or your choice.. 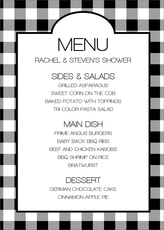 This set of modern and trendy menu cards are perfect for your upcoming event. Back of cards are fully designed as shown on sample. Size of cards is 5" x 7". 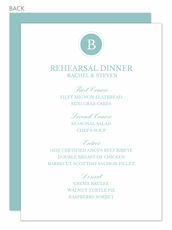 Flat printed in ink color and..
A Stationery Studio exclusive! 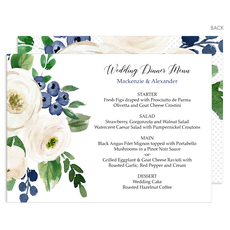 This set of beautiful floral designed menu cards are a perfect addition to your table settings. Back of cards are fully designed. Size of cards is 5" x 7". Flat printed..
A Stationery Studio exclusive! 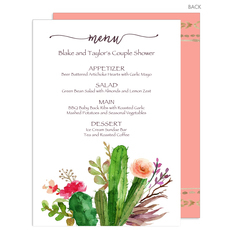 This set of beautiful Southwestern themed menu cards is perfect for your next event. Back of cards are fully designed. Size of cards is 5" x 7". Flat printed..